It doesn’t matter what time of year it is, whether it’s cold out or not, Pierre’s feels better when he has some extra heat. And let’s face it, sunbeams can be hard to find. What he needs is his own little patch of sunshine no matter what time of day it is. So when our friends at Art of Paws asked if he would like to try one of their heated mats, Pierre said he was the cat for the job. The Art of Paws heated pet mat is about two inches thick, and unfolding it from the box, I found it had a nice, removable cover that will make cleaning easy. The cord, which has a protective cover to prevent chewing, extends through the cover at one end, and an inline switch so you can turn the mat on and off. 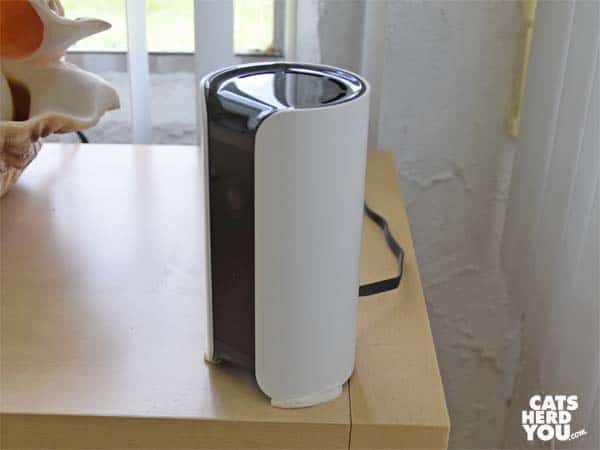 The covered cord connects to the shorter cord attached to a little power brick, and the power brick, of course, plugs into an outlet. I really liked that the whole cord assembly was over six feet long, so I was able to put the mat just about anywhere I wanted instead of having to be really close to an outlet. Setup is easy and common sense, no manual needed. Once the mat was set up, it took no time at all for Pierre to find his little patch of sunbeam-like warmth. I’m not sure exactly where Pierre’s arthritis is, but there was room on the Art of Paws heated pet mat to warm all of him so he’s sure to get comfort from it. The mat so big that you could fit two of him on it when he is curled up. Or he can sprawl across it and really soak in every inch of its warmth. The Art of Paws heated pet mat proved so popular that it when Pierre wandered off to use the litter box, a line formed to use it. Newton claimed it, and he immediately spread out to absorb the warmth. 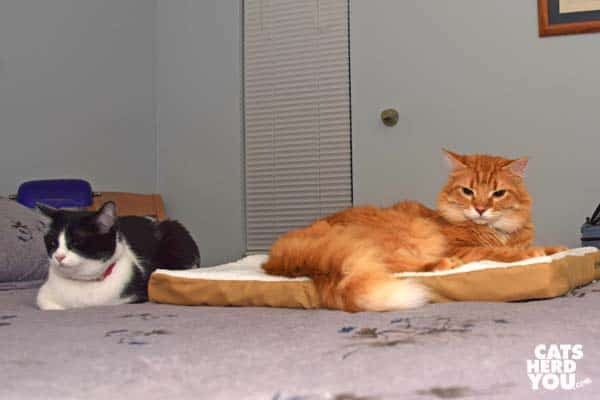 There was still a little bit of space left on the Art of Paws heated pet mat, even with him spread out, and Cupcake saw her chance to get some of that warmth. 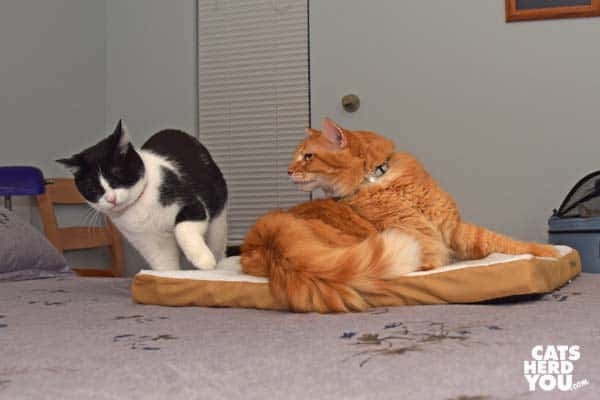 She stepped onto the mat right next to Newton, but Newton made it clear he wasn’t in a sharing mood. Cupcake decided she would wait in line for her turn. Getting a chance to hang out on the heated pet mat would be totally worth it! All of us are big fans of the Art of Paws heated pet mat, and we give it enthusiastic paws up. 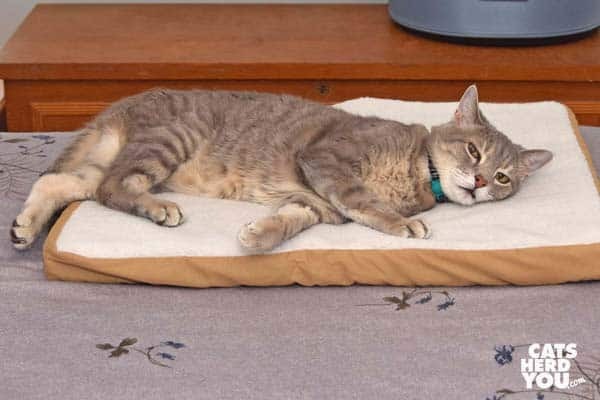 If your cats want their your own heated pet mat, you can get 15% off your order at the Art of Paws US or UK site with discount code catsherdyou. The discount is also good for their cool wall shelves and scratching posts, too! FTC Disclosure: We received this heated mat at no charge from Art of Paws. Receiving the free products did not influence our review. All reviews on Cats Herd You reflect our honest and unbiased opinions. I knew that I wanted Cupcake to be a raw fed kitten. 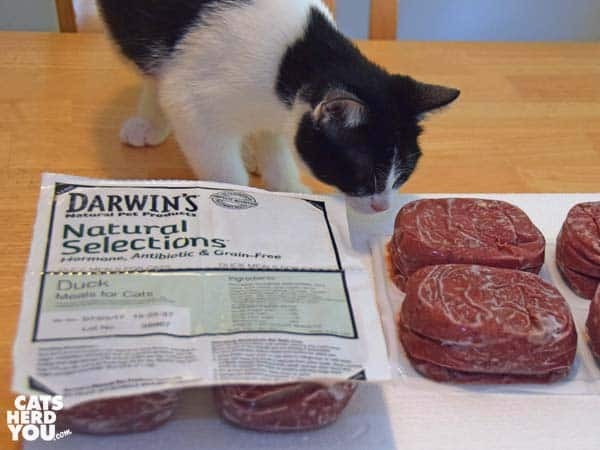 I wanted her to have balanced, species-appropriate nutrition, so when the folks at Darwin’s Natural Pet Food gave us a chance to sample their premium raw cat food, I thought it was a great way to get Cupcake started on a raw diet. Darwin’s is a mail-order company, and one of my concerns was making sure the food arrived still frozen. Everyone knows that Florida is hot in the summers. On top of that, when I’m not home, food is delivered to my porch, which gets the full afternoon sun. So I was really pleased to find that the box was lined on all sides with thick Styrofoam to insulate it. I was even happier to discover that there was still dry ice left inside, working hard to keep the food cold. 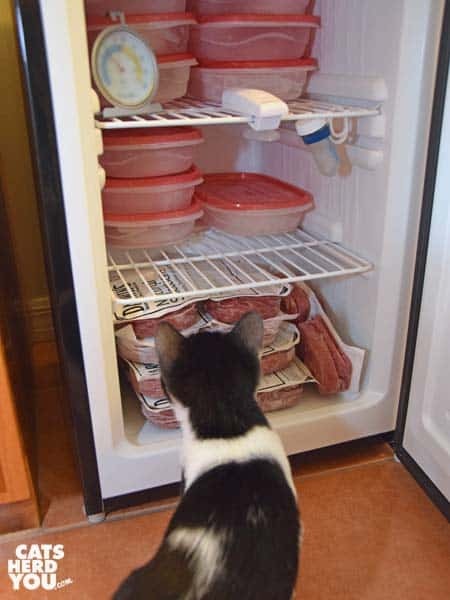 As a result, the food was still frozen. Win! The cat food is packaged really conveniently. Four vacuum sealed 1/2 lb amounts are attached to a perforated plastic sheet. That means each one holds 2 lb. That makes it easy to tell at a glance how much food you have on hand. What’s super convenient is that each 1/2 lb portion fits nicely into a 1 cup storage container. That allows me to thaw a portion overnight in the fridge in its original packaging. Once it’s thawed, it’s easy to store it safely while Cupcake eats it over the next couple days. Starting Cupcake eating Darwin’s wasn’t hard. Kittens usually are happy to try new foods. She had a little bit of Darwin’s raw food on the side with her canned food meal, and slowly the amount of canned food became less at meals and the amount of raw became larger. Success! 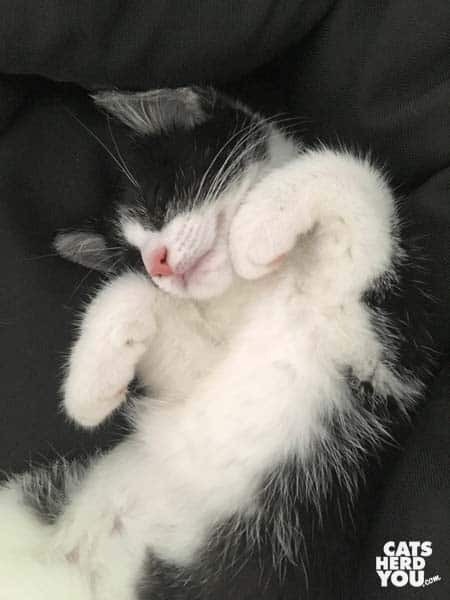 A healthy, happy, raw-fed kitten. I don’t even like being in the kitchen to make my own meals, so having Cupcake eating raw cat food without my having to make it was great. I loved having my little obligate carnivore kitten eating a diet from a company I trusted to use the best ingredients to make a wholesome food for her. And the convenience of their grab-and-thaw packaging was just awesome. Happy, healthy Cupcake, and happy me, too. Then something happened that is the reason this review didn’t happen months ago. 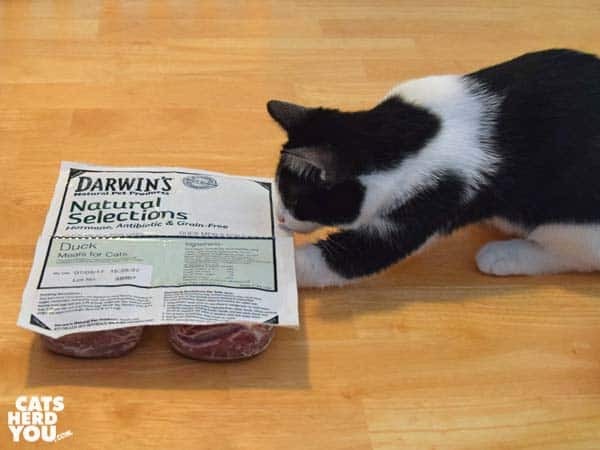 We ran out of our sample of Darwin’s raw cat food. This would never have happened if we had been enrolled in the Drawin’s home delivery program, since it is set up to ship to you on a schedule. But since Cupcake ate eating large, growing-kitten portions, we ran out of our sample more quickly than I expected. This was when we discovered Cupcake wouldn’t eat any other raw food. She rejected the homemade raw I prepare for Newton for his unusual urinary pH needs. Then she rejected raw made another cat food company. Since a growing kitten has to eat something, I let her go back to eating canned food. I wasn’t quite ready to give up yet, though. 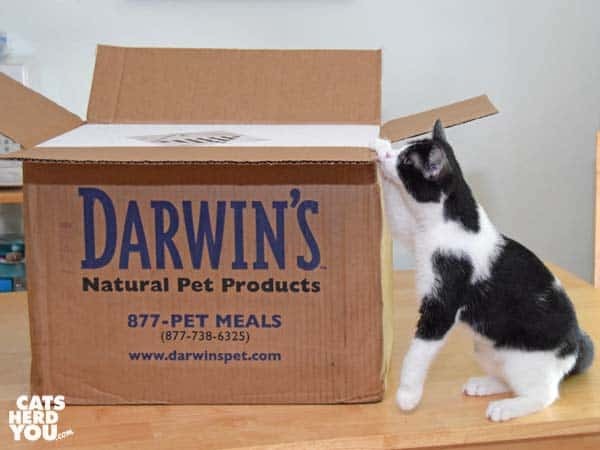 I ordered some more Darwin’s food. The second transition didn’t go as easily as the first. Cupcake would avoid the raw food paired with the canned food on her plate. When I put some raw food on top of the canned, she would eat through it, pushing it to the back of the bowl with her nose. She ended up wearing more on her face than she ate. When Cupcake started eating some of the raw food again, we found she wasn’t keeping her meals down, which was puzzling. I finally tried giving her a full raw meal, and that stayed down. Her stomach apparently didn’t like meals mixing both raw and cooked ingredients! It turned out the biggest barrier to getting Cupcake eating raw food was her human being overcautious in transitioning her. So Cupcake is a happy, rambunctious raw-fed kitten again, and she loves her Darwin’s raw cat food meals. She knows they come from the refrigerator, and she comes running when you open the fridge to see whether you’re bringing out food for her. 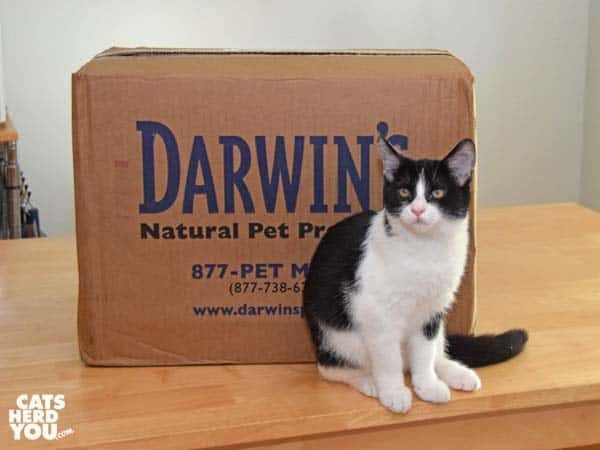 If you want to try Darwin’s Natural Pet Products premium raw cat food for your cat, they offer a great trial offer for their food. 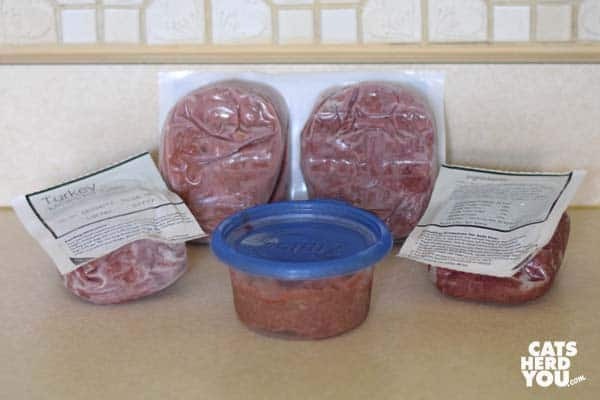 You can get 10 lbs of their premium raw cat food for the price of shipping. 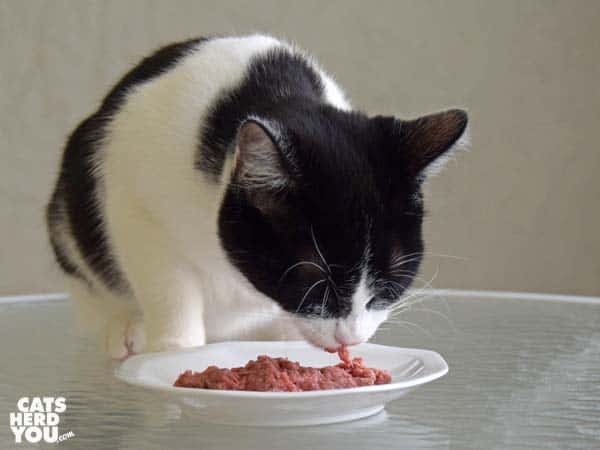 It’s a great way to try raw food for your cat with very little financial commitment. FTC Disclosure: We received this product for free in exchange for our honest opinion. The opinions in this review are my own and not influenced by any outsider. Sponsored posts always reflect our honest opinions and feature products we use ourselves and love. 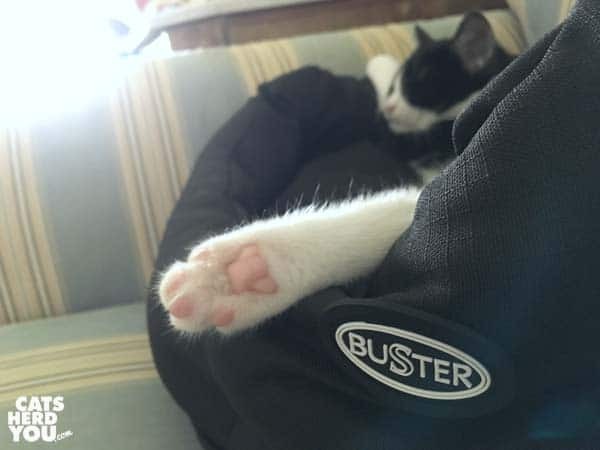 Our friends at KRUUSE sent us a small Buster Cocoon bed, and when I saw it, my first thought was that it was perfectly kitten-sized. And it turns out I have a kitten in the perfect color to match it the black sample bed. I set the Buster bed down on the sofa, and Cupcake climbed right into it. The bed is remarkably plush, with a removable cushion. 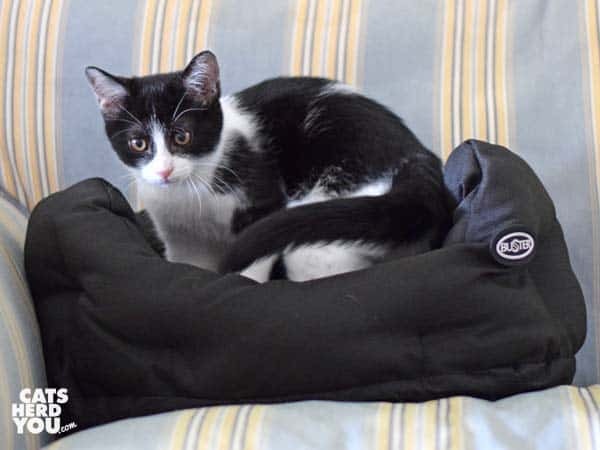 We have never had cat bed in the house that had a removable cushion, so we didn’t expect to find cat toys under there. I haven’t decided whether Cupcake is just a hoarder, or whether that spot is intended as bonus toy storage. Unlike any other beds I have seen, the Buster bed is made of a rip-stop polyester material that is really easy to clean. 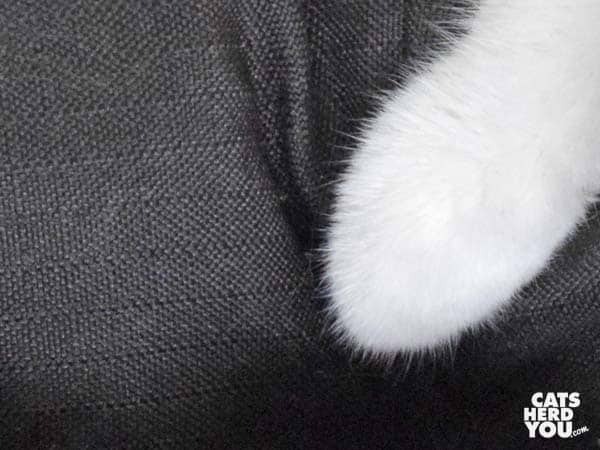 Cat hair doesn’t stick to it, and it’s designed to be water repellent, too. You can machine wash the whole bed in warm water, if necessary, but the polyester cover is so easy to clean that it has kept me from needing to do that so far. 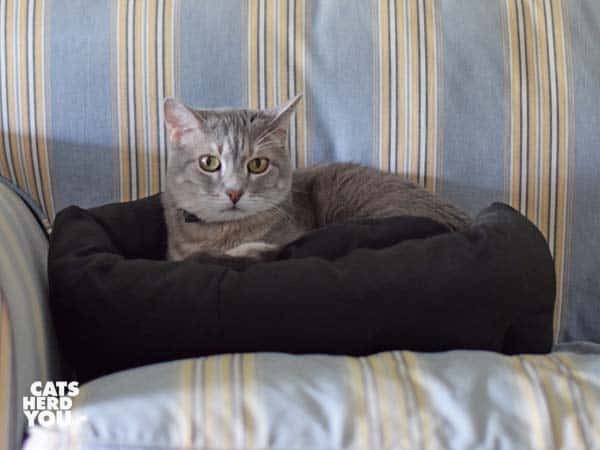 The Buster cocoon bed is a rounded shape that is perfect for a kitty to curl against the thickly cushioned side. That’s how Cupcake loves to sleep in it. We have the Buster bed on our sofa. 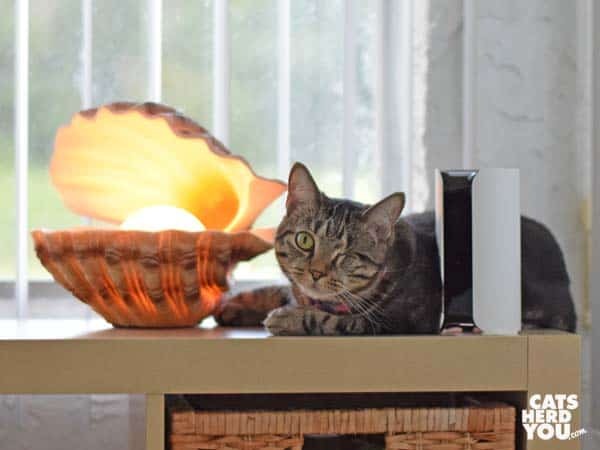 Cupcake often goes to another room to nap, but with the Buster bed in place, she sleeps there instead, spending more time with the family while we’re watching television in the living room. Cupcake: Really, James Bond again, Dad? The Buster bed comes in three sizes, and the small size is 18 inches wide. 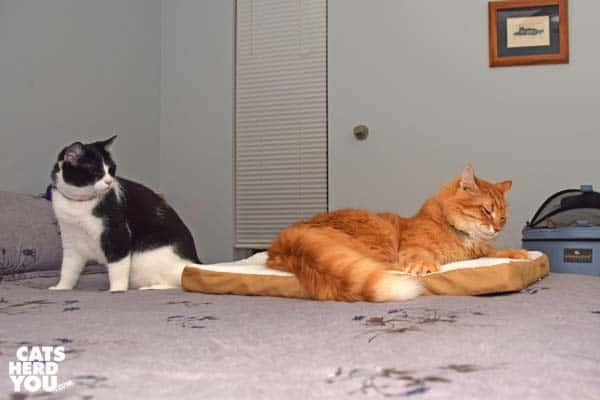 When I first saw it, I thought it looked kind of small, but that was because the sides of the bed are so thick, the center part of the bed where the cat sleeps looks a little bit smaller than I expected. 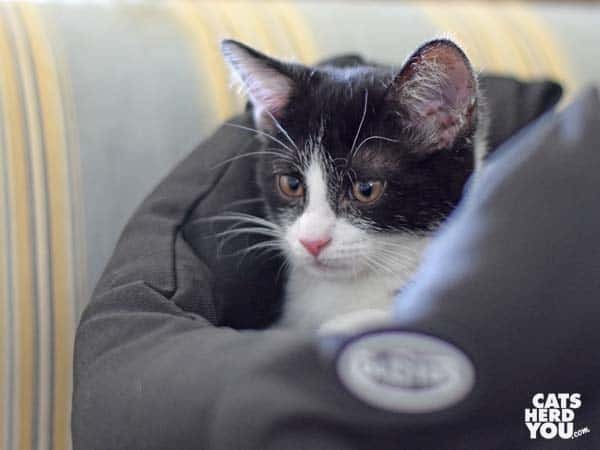 When I first saw the bed, I thought for sure that only Cupcake would want to sleep in it. Pierre decided to prove me wrong. 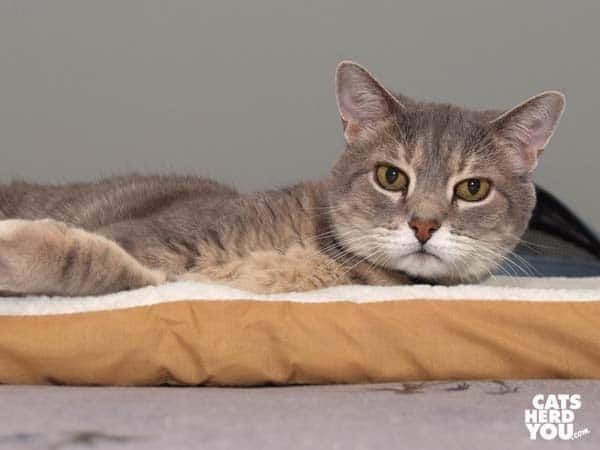 Pierre is a lean 11 lb cat, but he fits into the small Buster bed with room to spare. 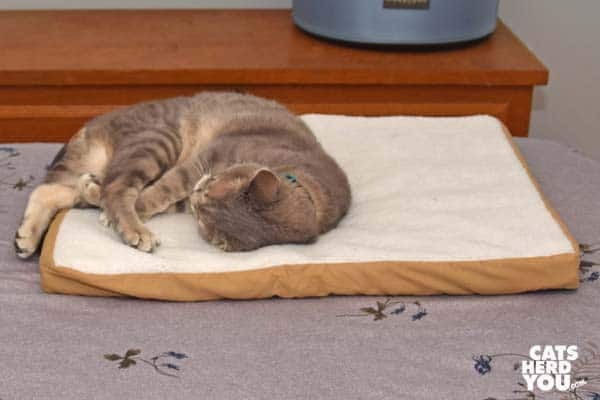 If your cat likes to sleep curled up, the 18 inch small bed is a cozy getaway, even if your kitty isn’t a kitten any more. There are also 25 inch and 29 inch versions for larger cats who like to spread out. Cupcake gives the Buster bed four paws up… except when she has one paw dangling out of the bed while she snoozes. FTC Disclosure: We received the Buster cocoon bed from KRUUSE in exchange for our honest review. The opinions in this review are my own and not influenced by any outsider. Sponsored posts always reflect our honest opinions and feature products we use ourselves and love. 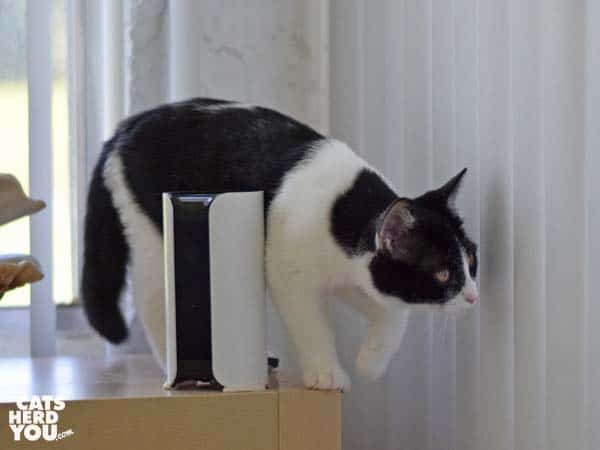 I got a camera to watch my cats when I was out of the house, but to get it to reliably trigger when they walk across the floor, I needed to put it at the edge of the shelf. That posed a problem. Not only is the edge of the shelf a dangerous place to put a camera, it is also right above one of the cat water bowls. It’s not like that shelf is a low-traffic location, either. It’s a key access point to one of the only windows in the house that faces west. 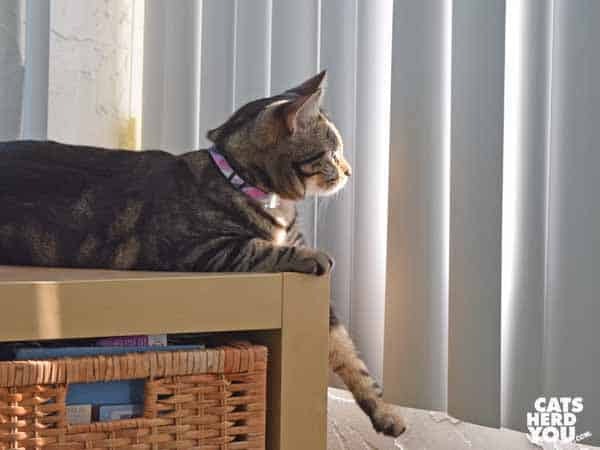 That window features some good bird watching, too, so it has always been a regular hangout for all of the cats. I remembered reading about a special, removable putty you could use to hold objects in place, so I did a few searches and found Quake Hold museum putty. Maybe everyone in California already knows about this, but those of us in Florida never got the memo about this stuff. 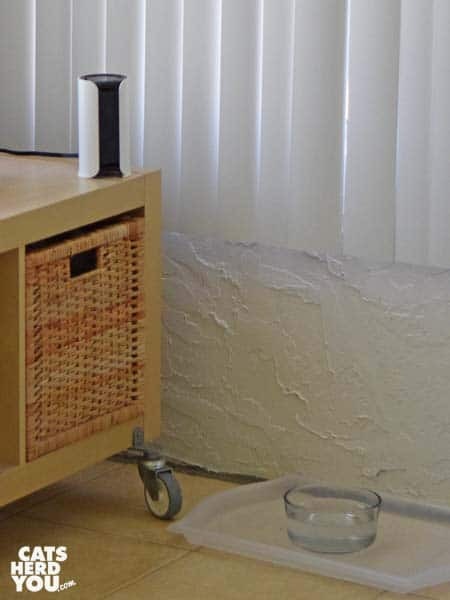 So for folks who never heard of museum putty, it’s inexpensive stuff used by museums and I guess people who live in earthquake-prone areas to keep knickknacks from falling down. It isn’t much to look at. 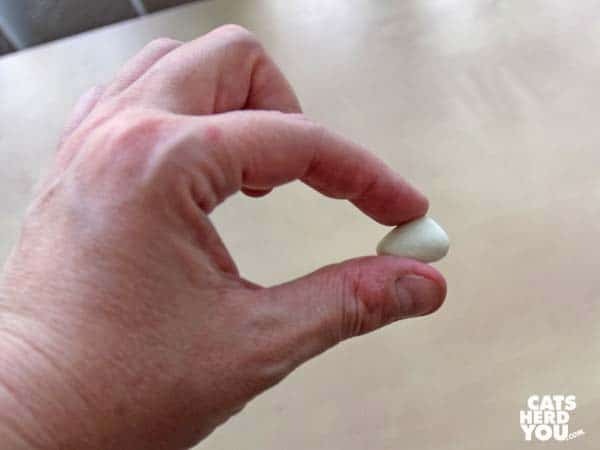 It’s an off-white putty you work with your fingers to soften. 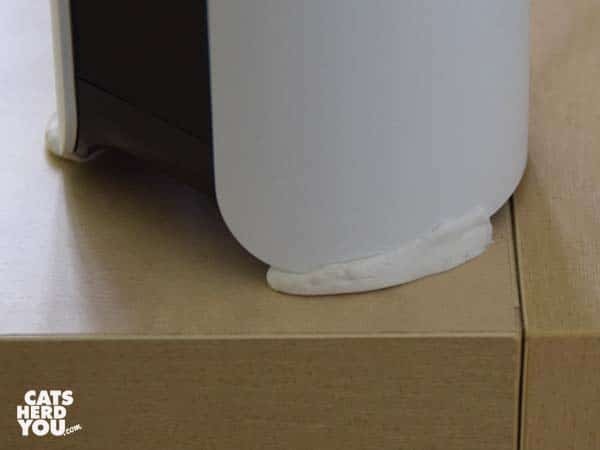 You can work it to whatever shape you need to fit under the base of your breakable object, then smush the object you want to stay put down onto it and let it cure for 24 hours. That’s pretty much it. For my camera, instead of round dots of the putty, I made a little putty snake and fit it around the base of the camera before smushing the camera down into it. I was worried that there might not be enough surface area of the camera in contact with the putty, but it has stayed put for a month now. Since the putty started helping keep the camera in place, the camera has seen a lot of traffic, especially from Ashton. Video taken from the camera shows her jumping up and down directly next to the camera, often close enough that you can hear her rub against the camera as she jumps. It also captures her sitting directly next to the camera, pressing against it in ways that would have dislodged it if it hadn’t been secured. Ashton isn’t shy at all about leaning on the camera, even when she knows she is being watched. If it wasn’t held in place somehow, I’m sure the camera would have toppled by now, probably while I was taking this photo. Thank goodness for Quake Hold! It costs under five dollars, and I can’t believe it has taken me this long to find out about it. Hopefully some of you reading will break a few less knickknacks or other valuables now that you know about it, too. This post contains an affiliate link, which means we receive a small percentage if you make a purchase using the link on this page.